Lucy Calkins, author of many books on teaching writing, often says that conferring is the heart of writing workshop. I once heard her say to a group of graduate students that she wished we called it “conferring workshop.” This way it would be clearer to everybody that it is the conferences that really make the difference with kids, not just the minilessons alone. 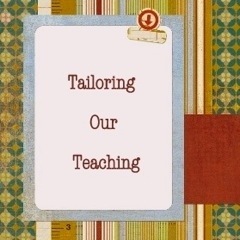 Conferring is one of the ways we tailor our teaching to each individual student. If you’ve ever had the pleasure of having somebody really confer with you about your own writing, then you understand why conferring is so very important. One really great writing conference is enough to live off of as a writer for weeks, months, and sometimes even a lifetime. Because of that, I work really hard to make sure that I get around to every student at least once a week to hold a one-one conference, or to involve them in a small group lesson. I never want kids to go more than a week without that support. And because of that sometimes I feel like I am in a race-against-the-clock to get to every kid. It’s true. You do have to move during writing workshop. There are kids out there to meet with, groups to pull, support to give, goals to be discussed and then checked in on, accommodations to be made, mid-workshop interruptions to be had… it can be quite overwhelming if you don’t have a game plan. So, I’ll let you in a secret. I always have a game plan. Gone are the days where I headed into each new day of writing workshop, ready to just wing it and hope that I could get to as many kids as possible by the end of the week. Now, I have a system. 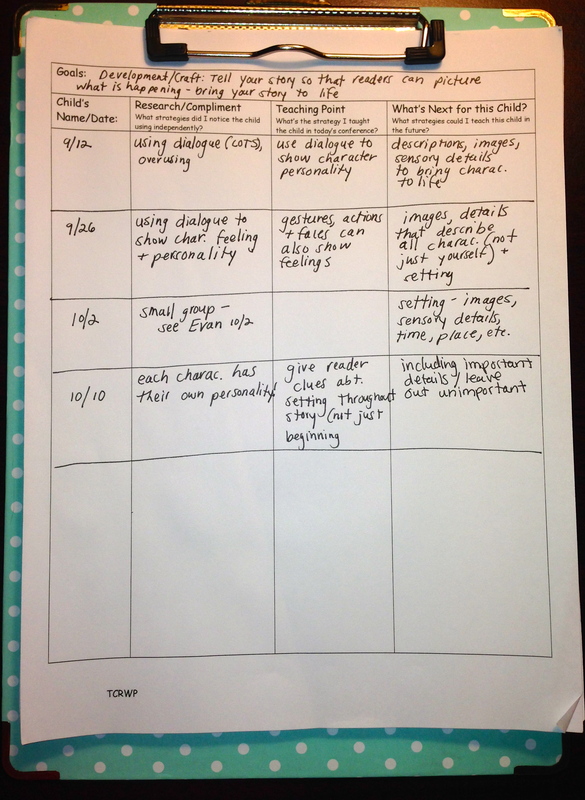 A conferring sheet that captures your research, compliment, and next steps can keep you organized and on track with each one of your students. I like to have one sheet per student, and I just flip to that kid’s page when I confer with him/her. I usually linger for just a moment at the end of the conference and take my notes while the student gets to work on his/her writing. Above are my notes for Luke, across the narrative unit of study. The goal listed at the top of sheet was based on his on-demand assessment administered at the start of the unit. 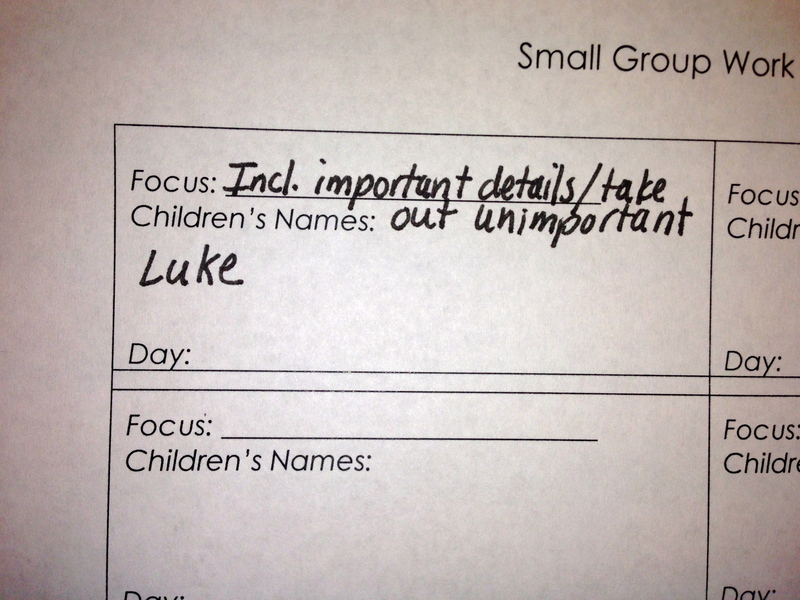 If you read across my notes, you’ll see that most of my work with Luke supports his writing goal. You’ll also notice that the conferences tend to follow a thread, a line of thinking, rather than jumping around to totally different strategies from week to week without any follow-up. 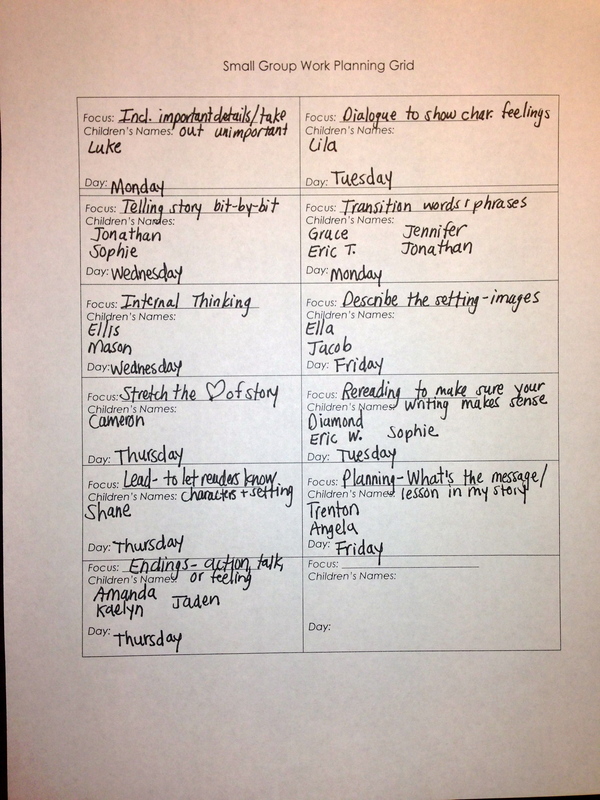 This planning grid helps me use my conferring notes to plan ahead for the upcoming week. This planning grid helps me pull students together who have similar individual needs. Now, at a glance it might appear as if you could just name the groups first, and then add a list of kids to each focus group—not so! If you really want to tailor your teaching, you must consider each individual child first, then plan the group—not the other way around. These groups are completely flexible–meaning I might not pull the same group of kids together next time. When I meet with the kids, I’ll make note of each of their individual next steps yet again, and then repeat the cycle of planning at the end of each week. Step 4: Now that I’ve listed out students who have similar needs, I plan which day makes sense for each group or individual conference. In general, I try to see the students that need the most support early on in the week. Also, there may be some students who I plan on seeing more than once–I simply make sure to plan those meetings on different days. Lastly, I try to estimate how long each group or conference will probably take so that I can budget my time accordingly. Usually, there is plenty of time left over on any given day for a few other impromptu conferences or small groups. With my tentative plan in hand, I can head into the upcoming week confident that I can see all of my students at least once, if not twice. Not only that, but my plan is based on my assessment of their individual needs. Voila! With useful conferring notes, you can base your instruction on individual needs without making yourself crazy. No more winging it! This is great, and mirrors the process I use. I’m trying to move to Evernote, but speed at recording my notes is still a challenge. Often, I post headings of individual and group conferences in the classroom (i.e. Include Important Details/Take Out Unimportant etc.). Then, I ask kids to predict the conference they will be attending. If they don’t know, I ask them to pretend they DO know. Almost always, kids pick the “correct” conference. It’s a great way to encourage students to trust their instincts about revision. Excellent – a clear and thoughtful way to make sure each child’s needs as a writer are met with. Thanks for sharing this, Beth. This is such a wonderful system! I always feel that if I don’t plan conferences/small groups ahead of time, I get caught up in questions and don’t get to everybody as much as I would like to. Thank you for the visuals and the ideas! Thank you so much for sharing. You help bring clarity and efficiency to my writing instruction! Interesting ideas about writing and the power of conferring with students. This is wonderful, Beth! Such a clear and systematic way to plan for writing workshop! Will definitely be sharing this with teachers!